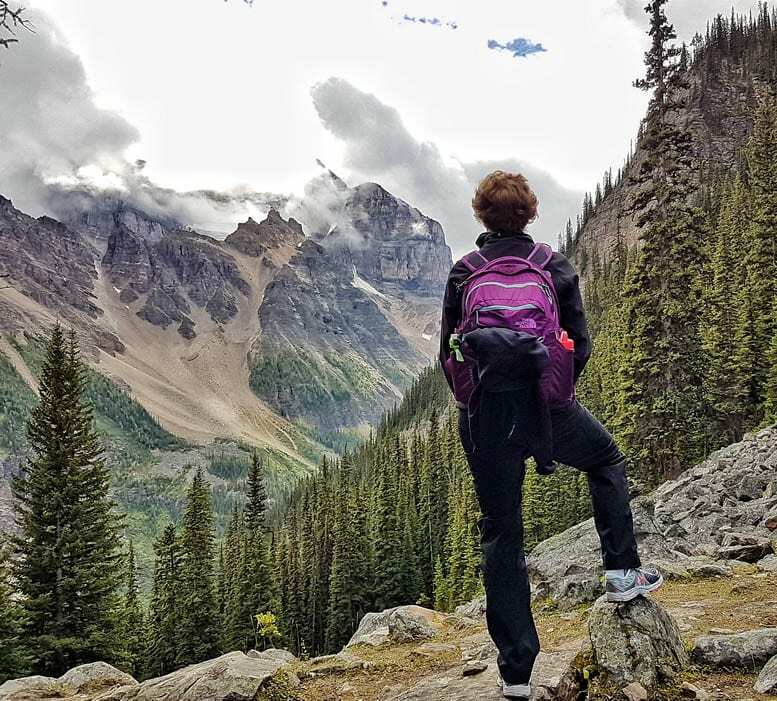 The Lake Agnes Teahouse – Little Beehive hike delivers some of the best scenery in the Alberta Rockies – though the hike up to the teahouse is often ridiculously busy. 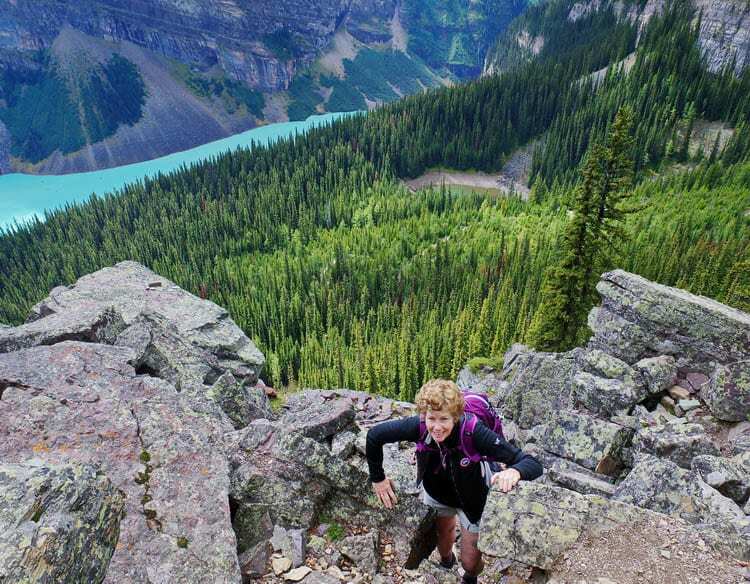 Do you have a favourite Lake Louise area hike? The locals often avoid the area like the plague because of the crowds – but if you’ve come from afar you need to see Lake Louise. Plan to be at the parking lot by 9:30 AM at the latest if you don’t want to park way down on the road – or worse – have to take the free shuttle from the Trans-Canada Highway. With larch season fast approaching, I’d bump the time up to 8:30 AM to be on the safe side. From the western end of the parking lot walk around in front of Chateau Lake Louise to the northeast shore of Lake Louise. You’ll see a signed path here disappearing into the woods. It climbs steadily via switchbacks. At the 2.6 km mark you reach Mirror Lake – which at this time of the year looks more like a puddle. Stay right on the main trail towards Lake Agnes. In another 10 minutes the first of many fine views appears. At this point too, you’ll start to see larches. At the 3.0 km mark, take the signed trail on the right to the Little Beehive. It’s a moderate climb and within 20 minutes you should be on the summit. There is the opportunity to lengthen the hike by several hours if you climb Mt. Saint Piran. To find the trail for Mt. Saint Piran look for a sign with the name scratched and barely visible about 15 minutes up from the junction to Little Beehive. Hike up on a mossy floor even for a few hundred metres as its thick with larches and very beautiful. Plan to spend some time at the Little Beehive. It’s a gorgeous area with a fraction of the crowds you’ll find at Lake Agnes. To get to the teahouse retrace your steps to the first intersection but keep right or you’ll be descending all the way down to the main trail. Signs will lead the way. It’s only 600 metres between Little Beehive and the Lake Agnes Teahouse. You should know that you must sit down if you want anything to eat or drink at the teahouse. Instead of joining the throngs on the descent from the teahouse, take the trail that goes along the lake directly in front of the teahouse that is signed for Lake Louise and the Highline Trail. It descends steeply to Mirror Lake where you then pick up the trail you ascended earlier in the day. You’ll be back at Lake Louise in just 2.6 kms. All told you can do the hike in 2 – 3 hours – but it’s worth packing a lunch and lingering. Or bring your knitting like the person in the hammock did (pictured in one of the photos below) and get lost in the view. If you like solitude this loop hike is probably not for you – unless you’re prepared to get a very early start. I’m a fan of the hike – because it’s beautiful and accessible. And afterwards if you’ve got an hour and $85 to spend, you could rent a canoe and paddle to the end of Lake Louise for a great, albeit touristy way to finish off the day. Lake Agnes is surreal! Just like your in a dream but definitely will add this on my bucket list! I’m finally starting to plan my trip for this summer and your blog has been incredibly helpful! Of course when I booked my flights last year I had no idea it was Canada 150, so I’m a little apprehensive about the crowds, but I’m looking forward to some rewarding hikes. Thanks for all the great guides! Now I’m planning to travel this coming summer and your post has been of great help for me to see possible views I wanna go. and this lake is one of a kind! @Kathrin It is a very beautiful spot. Don’t miss nearby Moarine Lake either.